Here the vehicle (or RV) must perform its intended performance for at least thirty days. Drivetrain, appliances etc. Time periods and conditions depend on the province. As cwerdna said, in California there's no requirement for a dealer to offer any sort of warranty. 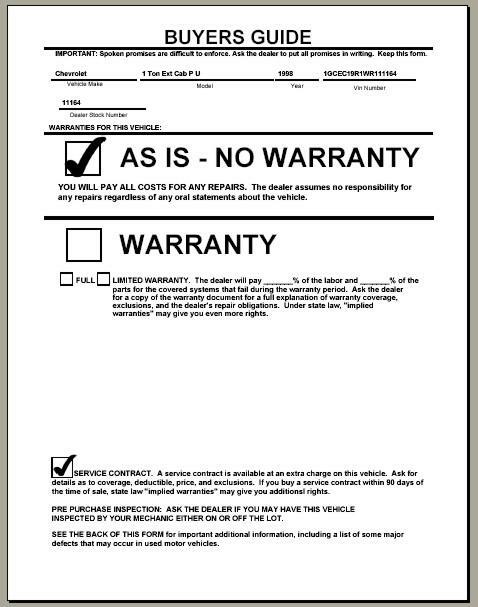 In this state, dealers are required to post on every used car for sale a sticker on the window showing what if any warranty is being offered by the dealer; I see many that have the "As is -- No Warranty" box checked, particularly at used car dealerships not affiliated with a new car dealer (CarMax, and "Buy Here Pay Here" dealerships being the notable exception). "California Warranty Law: While some states require used cars to be sold with a warranty, California is not one of them. Generally, if a dealer provides that the vehicle is to be sold “as-is”, the buyer is on notice that the dealer is providing no warranties and the vehicle may have defects. However, there are two exceptions that require the dealer to provide a mandatory: 1) the dealer is a “buy-here-pay-here” dealership, or 2) the vehicle is a “certified” pre-owned vehicle. “Certified” Pre-owned Vehicles Exception - in order for dealers to advertise that they are selling “certified” vehicles, California requires each vehicle come with a minimum of a 30 day implied warranty of merchantability. This is a basic warranty claiming that the vehicle is of adequate quality." cwerdna wrote: Wild question... is there significant demand for a US market Leaf in Canada located in Nor Cal? If yes, how much do you think I could get for it? I've noticed prices in California are quite low on Craigslist. I was hunting for a leaf and I pulled the trigger on mine when it came up for $5500 1 year ago. Every other Leaf in my area was $7k+ for 2011/2012 and 9k+ for 2013+. My car was an 8 bar 50k mi 2011 SV w/o QC and no cold weather package or backup camera. It did have aftermarket leather. In my area (Missouri), your car would be listing for $9-10k and I would expect it'd probably sell for $7k pretty fast. I have seen a 2012 7-8 bar for 7k just sitting in a dealer lot, so I know the 2011/2012 value isn't great. I've seen similar cars listed for lots less in CA. Good luck selling yours. At least your battery is in much better shape than mine. I'm sure you can do far better than $5k if you sell it yourself. Keep in mind most sellers probably aren't comfortable with a remote sale, so it might be hard to do. I've noticed prices in California are quite low on Craigslist. That's the tough part with out of state sales. It's not convenient for the other person to come look. And, they have to pay to have it shipped, besides the extra risk. I brought my Leaf to a Nissan dealer that I sometimes go to for service to have them appraise it. The guy I first spoke to on the phone was a newb (only there for 2 months and he was busy anyway) and I was handed off to someone available. He immediately knew it was a '13 SV w/premium package. I told him it didn't have the quick charge port. I told him the mileage was at about 63.5K miles and he powered up the car. But then the sales droid kept saying 65K miles (no, 63.5K) miles and kept calling my car a "base SV". No. I said again, it was w/premium. He went to speak w/his manager. I told him that Carmax was willing to offer me $5K. He said I should take that. They just didn't want to buy cars w/o the CHAdeMO inlet. And, he felt my car was "high mileage". Hehe. Last time I took my Leaf to another dealer for service and the SA felt my car's mileage was low for its age. I can understand their POV though. Some people think they want or need the DC FC inlet. Judging by posts here on other Leaf FB groups, many buyers probably know nothing about battery capacity and just look at age, mileage and price. The CL asking prices at https://sfbay.craigslist.org/search/cta ... _year=2013 are sometimes an enigma. I looked thru eBay Motors sold listings and they were of little help. I found https://www.ebay.com/itm/2013-Nissan-Le ... _cvip=true and wonder if it really went thru. IMHO, $6800 for an 9 bar '13 S w/charge package and 63K miles is on the high side. The seller was in So Cal. I was planning to try another Nissan dealer today but their appraisal guy was out so but will be in on Tuesday. Will call them first to see if they'd want it and there's any possibility of at least $5K. If no, I'll try advertising my at work first. If someone offered me $7K (seems unlikely in Nor Cal), it'd be a done deal. Looking at the age of the car above, I seem to recall that the state warranty requirement here has both a price cutoff at the bottom end AND an age limit, beyond which no warranty is required. We have those stickers too, and you see them on cars that are old, extremely high mileage (another possible loophole) or cheap for some other reason. cwerdna wrote: I looked thru eBay Motors sold listings and they were of little help. I found https://www.ebay.com/itm/2013-Nissan-Le ... _cvip=true and wonder if it really went thru. IMHO, $6800 for an 9 bar '13 S w/charge package and 63K miles is on the high side. The seller was in So Cal. Agreed. Seems high even here. I'm not sure how critical CHADEMO is in Missouri--I don't have it on mine either and really I don't mind. My main problem is the range--I can only go ~20 miles in the winter. There are only about 2 CHADEMO chargers in range of my house anyway (but about 100 J1772 chargers). cwerdna wrote: I was planning to try another Nissan dealer today but their appraisal guy was out so but will be in on Tuesday. Will call them first to see if they'd want it and there's any possibility of at least $5K. Honestly, the $5k doesn't sound like a bad deal at all. If you could find a buyer here for $7k, minus shipping , you'd net $6.2k. So you basically lose $1.2k for a hassle-free sale. I'm not saying you should take the $5k, it's just usually I've seen car lots offer super low-ball prices because the auction values on Leafs are SO low. cwerdna wrote: If no, I'll try advertising my at work first. If someone offered me $7K (seems unlikely in Nor Cal), it'd be a done deal. Try posting on the "for sale" section in this forum. I've seen cars go fairly quickly at $7k, even out of state. You have a good posting history, so that reputation will help you selling here. Buying a random car out of state on Craigslist would terrify me. Not so much from a regular poster on this forum. If I were looking, I would consider your car. cwerdna wrote: I told him that Carmax was willing to offer me $5K. Ok, appraiser dude had to also check w/his manager. He then gave me bad news about how low it was and asked if I wanted to see the paper. They screwed up and listed mine as a base '13 S (so no nav, no premium package, no 6.6 kW OBC, no cruise control, etc.) and then for some bizarre reason put down 69K miles when I showed up with 63.6K miles. So, the wrong car they valued at around $3400 or $3500, then they took off an arbirtary $1900 some for "reconditioning" (complete BS given that its condition is almost identical to when I bought it from a used car dealer, in fact all the tires esp. the fronts which I just bought a few months ago are in better shape). So, it came out to $1500 some! I told the guy about all the mistakes w/the trim, package and mileage and he apologized that it was so "unprofessional" then went back to his manager. He came back saying it wouldn't raise it by more than $1K, if the quote were fixed. Clearly, they don't want it or they think I'm a sucker. I told them early on that Carmax was willing to offer me $5K.